Investors are hoping for a calm day of trading after Tuesday's mini flash crash. Markets briefly tumbled after the Associated Press Twitter account was compromised and used to erroneously report explosions at the White House. U.S. stock futures were up slightly Wednesday morning as investors geared up for another batch of earnings. Boeing (BA) reported a 20% surge in year-over-year net income, despite a drop in revenue from its grounded Dreamliners. Ford's (F) also reported a jump in earnings, helped by sales in North America. Procter & Gamble (PG) reported better-than-expected earnings and revenue but lowered its guidance for the current quarter. Shares of Juniper Networks' (JNPR) fell 6% in premarket trading after it projected "continued weakness" in its earnings outlook late Tuesday. AT&T (T) reported quarterly earnings in line with expectations but sales that came up short. Shares of Yum Brands (YUM) jumped nearly 4% after the fast-good restaurant operator reported earnings that topped Wall Street's low expectations. Sprint Nextel (S) beat profit estimates, while revenue was in line with forecasts for the latest quarter. After Tuesday's close,Apple (AAPL) reported earnings that beat expectations and announced it would raise its quarterly dividend and boost its stock buyback program. But profit fell 18% as the iPhone and iMac maker reported that consumers are gravitating toward its cheaper devices, which hit profit margins. Also before the opening bell, the Census Bureau will release data on durable goods orders. Briefing.com's consensus of economist opinion forecasts that orders dropped 3.1% in March. Even with the errant tweet, U.S. stocks finished higher Tuesday. 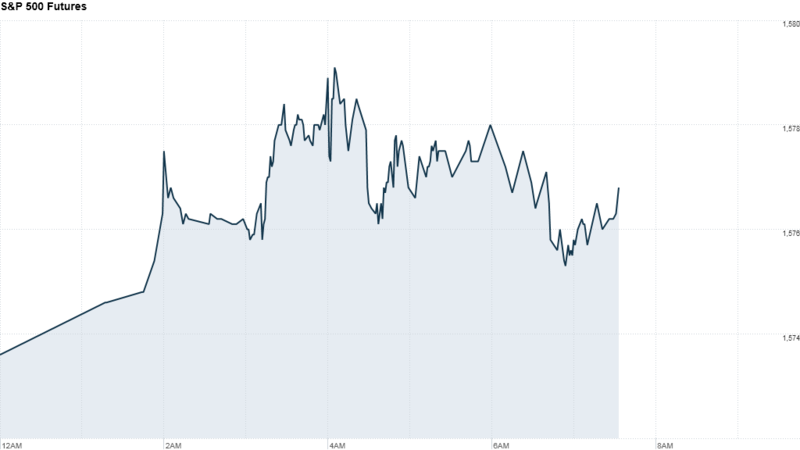 European markets rose in morning trading, supported by continuing talk of a ECB rate cut following weak eurozone data. The Ifo German business climate index for April was weaker than expected.